Our goal is to offer the best options for your safety when it comes to truck and bus control on the snow and ice. 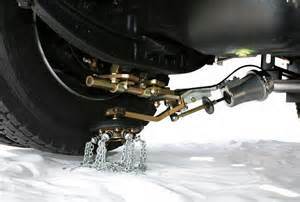 We have been installing RUD automatic ice chains on trucks and buses serving the Denver and Brighton area for over 14 years. RUD chains guarantee the highest possible safety and performance for maximum traction on snow-covered and icy roads. Their product range offers a perfect solution for every application for trucks and buses. We have been installing RUD auto ice chains on various fleet trucks and buses for our clients in Denver, Brighton, Castle Rock and Fort Collins area. Your safety is important and with the weather here in Colorado it is important to be prepared. We are a bus, truck and RV repair and service facility serving clients from Castle Rock, Denver and Fort Collins, Colorado area and beyond. Family and veteran owned & operated since 1999, TMS Truck & Bus has a large facility to accommodate almost any truck, bus, or RV. We are very honest and believe in quality repairs that are done the correct way the first time.